I’m sure there are not many Buck Lakers who haven’t boated past the striking rock structure on Pulpit Island, known as the “Devil’s Pulpit”. 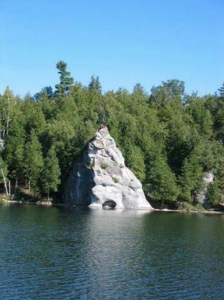 Our cottage is directly across from it and it is common for boaters to slow down and gaze at its unusual shape. Pulpit Island is a natural gem of the region. The island is Crown property and as long as this is so, it will remain uninhabited with only a modest camping site to indulge the odd overnight visitor. This beautiful island might today be private property and occupied by a number of homes and cottages were it not for an historical twist of fate. From the west shoreline opposite Pulpit Island and extending west from there, the Roushorn farm existed. When the government granted this land to the Roushorns, the family believed that Pulpit Island was part of this. They used it as their own. They pastured cattle on the island. The cattle would be swum over in the spring and brought back in late fall. According to the late Doris Payne, Robbie Roushorn’s niece who lived on the farm from the age of six or seven, Herb Sears owned the adjacent property to the Roushorn farm, southwards to a floating bridge, where the culvert now exists. One day Herb Sears saw some men on Buck Island. He learned that they were government surveyors and immediately ordered them off the island. Unfortunately, he did not pass on this information to his Roushorn neighbours. Unbeknownst to Robbie Roushorn, the surveyors then went on to Pulpit Island. They surveyed it and then registered it as Crown property. Sometime later, when someone approached Robbie to purchase some of Pulpit Island from him, he learned that it was registered to the Crown. Doris Payne relates how Uncle Robbie wrote to the government to state his claim to the island. In his letter Uncle Robbie used some unfortunate wording when he said “…if I own the island, …etc.” According to Doris, the use of that “bloody word ‘if’” ruined his case. The government took advantage of the doubt and hesitancy in Robbie’s plea and refused to entertain his claim. This turn of events remained a sore spot for the Roushorn family, but in fairness to the government’s intentions, it told Robbie that it wanted to preserve a place on the lake that people could use without building on it. Today the Roushorns’ loss is our gain, as our visitors and we can continue to enjoy the pristine beauty and isolation of this wonderful island.